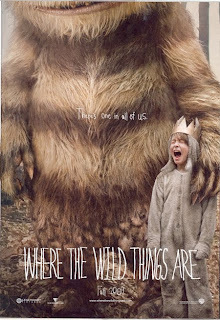 Today Where the Wild Things Are came out in theaters! I had planned on seeing it with some of my high school friends, but my Friday has deemed...well, busy. So, on Sunday I plan to see it with my mama. This seems to be perfect, anyways, because she was the one who used to read this book to me when I was little. 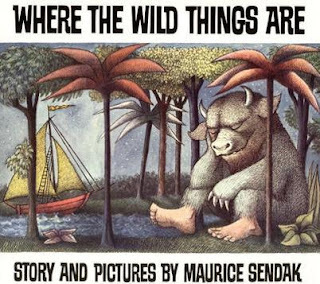 Actually, Where the Wild Things Are is one my fondest childhood memories.We even had a doll that went along with the book. My mom has recently dug up the doll for the movie premier occasion. I remember sitting in my brass bed with the missing bars and below my shelf of dolls, reading with my mom. By the way, I still have this bed. I painted it white and it is temporarily in Stella's room at my mom's. This bed also holds so many memories. It was my mom's when she was younger, then my sister's, then mine, then my sister's again, and then finally has returned back to me. I remember making forts out of blankets on it and jumping from it into my secret closet (not really that secret, but it was an extra nook I had in my room. It had a door. I used to pretend it was a portal to the other world. Kind of like Narnia.) Among the many things from childhood was my collection of headless Barbies. You may be wondering why they were headless...this comes with having an older tormenting brother. I also still have the dollhouse that my mom built for Christmas when I was 7. Being a controlling little girl I was [am], I took out all the carpeting because it needed to be shampooed. This also now sits in my room at my moms...carpetless since I was 8. Thank you for taking a walk down memory lane with me today...comment with your own memories! The other day after I had just finished getting my volunteer food handler's license, I pulled up to a stop light and heard someone honking very enthusiastically. I couldn't tell if some was extremely pissed off, a car alarm was malfunctioning, or someone was just having a good time. I looked around at my surroundings and behold, it was option number 3. The boy driving the car next to me was playing the jembay on his steering wheel. The sound I was hearing was the beat of the song he was playing in the car. The funny thing is, his music was too loud for him to hear the honking noise he was making with his rhythmic hands. His joy and oblivion gave me a smile. Thank you jembay steering wheel playing boy.